What Is a Reef Tank? Simply put, a "reef tank" is the closest thing to the reefs in the ocean that you can put in a glass box. Due to the size difference, the things you put in your reef tank have to get along with each other. In the ocean, a species being predated by another can move or migrate to a safer area. In a closed system like your 55g tank, the opportunity to flee is greatly limited. For this reason, the critters that you put in your reef tank have to be able to cohabitate peacefully. With a little research, you can build a piece of the reef where critters not only get along together, but in many cases will form a symbiotic relationship and help each other to thrive. The relationship of a clownfish and its host anemone is a perfect example of this co-existence. The clownfish is protected by the stinging tentacles of the anemone, while the clownfish brings the anemone food in the form of small fish that it captures, as well as the detritus that it deposits in the anemone. Reef safe fish who do not pick at corals or eat invertebrates. They also are not aggressive toward other fish. Reef safe invertebrates that do not consume corals. They are an integral part of a true reef tank, setting it apart from a fish only with live rock tank. Reef safe tank janitors, when properly selected, are amazing. They can cut your tank maintenance chores down to near zero. There are critters that will keep your aquarium glass clean, keep your substrate free of uneaten food and detritus, and will get fat in the process. Since corals are included in a reef tank system, sufficient lighting for the corals must be provided. The generally accepted rule-of-thumb for reef tank lighting is 3.5 watts per gallon of tank water for most soft corals and 4.5 watts (of fluorescent light) per gallon of tank water for hard (SPS & LPS) corals. 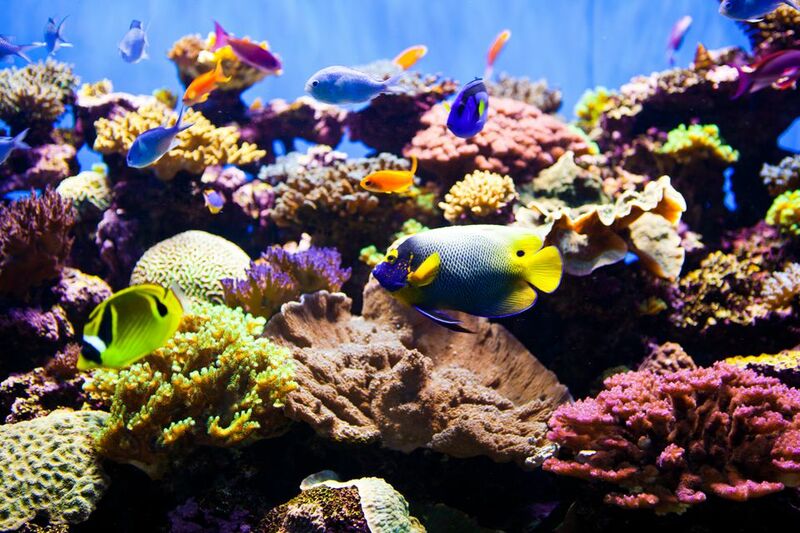 Since most corals cannot tolerate the levels of nitrates, phosphates, and other toxins that most fish and invertebrates will withstand, water quality in a reef tank is of utmost importance. While most of the expensive state-of-the-art filtration systems work well at removing toxins, they are not by any means required. With the advances in science and innovation, mini reef tanks are becoming more and more popular. Many reef tank aquarists design their own reef tank filtration systems using one or a combination of different filters to attain the desired results. "Reef ready" aquarium systems, which have the appropriate lighting, top gallon aquarium, and filtration already in place are available on the market today. These systems simplify the process of assembling or designing a reef tank system by yourself. While most corals require a high level of water quality and lighting, there are those easy corals that are less demanding, requiring a lower light level and/or a lower water-quality level, allowing novice reef tank keepers to attain success. The downside to the smaller tanks is that, when something goes wrong in the tank, it happens pretty fast, leaving little time to correct the problem before it turns into a disaster. With advances in the science of keeping corals and reef tank system designs, creating and maintaining a healthy reef tank is within almost anyone's reach.